A key to our success is to produce products here at our location, to ensure the quality product our customers have come to expect and deserve. Over the last 15 years we have purchased equipment that helps keep outsourcing to a minimum which ensures the high quality product that goes out our door. We continue to expand our service offerings and capabilities with state of the art software and manufacturing technology but will never abandon the hands on craftsmanship we are known for. We encourage our customers to come visit us at our shop as the walls are surrounded with samples of our work as well as material options. The samples range from exterior and interior signs, (carved, gold leaf, dimensional painted signs to interior signs as banners, show displays, dimensional lettering as well as engraving.) We also offer temporary signs (banners, property development signs, construction signs, real estate signs and well as contractor signs). Vehicle lettering is a large part of our business with fleet graphics being a part of that. There are also many other sign options not mentioned. We use durable materials to ensure products are long lasting and do not need to be replaced frequently. We work with suppliers who provide us with many recyclable and biodegradable options. They also offer materials made with recycled content. Within our facility we recycle all metals, plastics, cardboard and wood products. We also donate vinyl and other reusable items to local art programs. Our office recycles paper products, ink cartridges and electronic equipment. PolyTone is a product made from recycled plastics. It is a high-density UV stabilized two-color polyethylene sheet, laminated over a thicker contrasting color core. Ideal for engraving signs, logos, and graphics. Easy to clean, UV stabilized strong lasting finish. 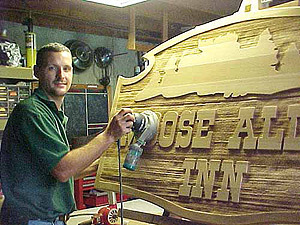 Applications: Engraved signs, golf course markers, logos and much more. SignFoam is a recycled product that has 240 recycled bottles in every sheet.